Let's get it out in open right away, I LOVE THE OLYMPICS! My family has teased me for years for my borderline "obsessive" behavior when in comes to athletes coming from all corners of the world to compete against one another. Even as I type this, I am wearing a bright red Canada hoodie (no joke), not to be confused with the other ones from 2010 and 2006 that are in my closet. Okay, may I am a bit obsessed (especially not having realized that I have 3 Canadian Olympic sweatshirts spanning 12 years until right this instant - and I'm not even Canadian). I've been fortunate to experience two of the games live, and have been known to clap and cheer along with my TV even when I'm the only one home. This past weekend, the frigid cold kept us indoors and coincidentally (I think probably not) glued to the TV. 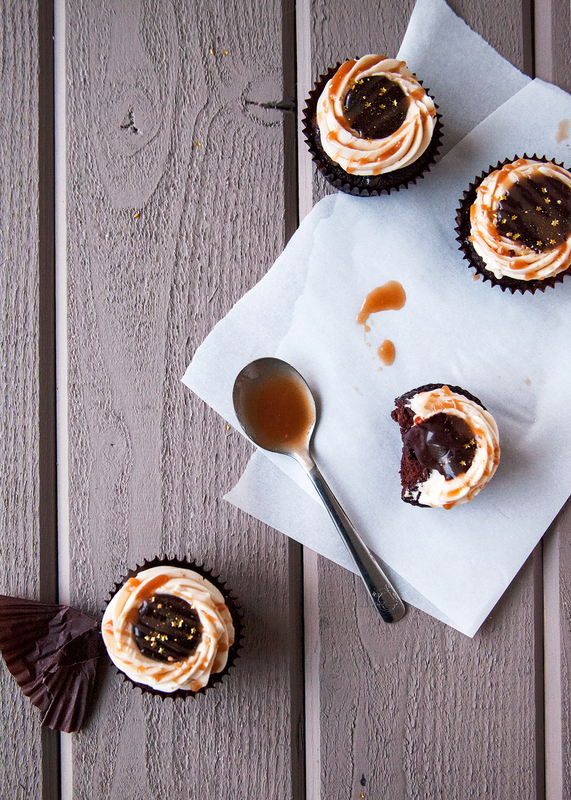 In celebration, I decided to make what I think might be the very best cupcake ever: Black and White Russian Cupcakes. You can thank my mom for this awesome throw-back to 2010. I've lived a fairly adventurous life so far. I love to celebrate different cultures, so maybe that is why I love the Olympics so much. Like I mentioned before, I had a change to witness some exciting times in olympic history. Lucky for us, the winter games have been played twice on the west coast in the last 12 years. I was just in high school when my family decided to go to Salt Lake City in 2006. 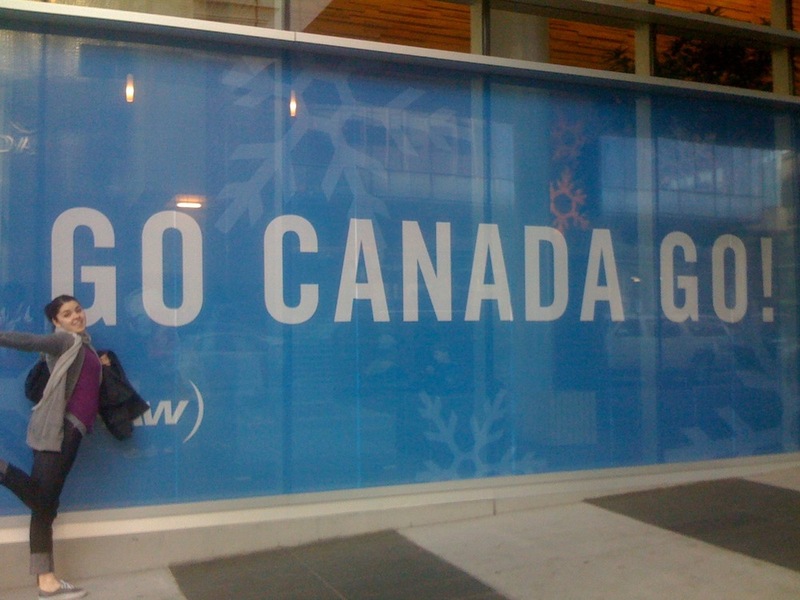 I remember exploring the Olympic Village and Park City with my brother and other visitors from around the world. We got to see ariel ski jumping, ice dancing, and a night bobsled run. We hiked up to the top of the hill near the start so we could see as much action as possible before the bobsled went whipping down the hill. I remember at one turn I tried to watch it, but the sled actually went above my head and I missed it. In 2008, I traveled around Europe with my college roommate Stephanie. The summer games were being held in Beijing, and we were determined to catch a little bit of the action. Between being jet-lagged and all the time differences, it was hard to keep up. I remember weaving thru the cobblestone alleys of Milan to find a dive-bar that was broadcasting US gymnastics at some odd hour of the night. It was especially interesting to see a different perspective of the games from the different countries that we were in and even footage of sports that don't normally air in the US like kayaking. My family first started vacationing in Vancouver when my father would attend a summer conference here. As the story goes, we all fell in love with the city and 5 years later my husband and I decided to live here. Before we did, my parents had a vacation home here. When I found out that the 2010 Olympics were going to be held here, I knew we had to go. My husband and I took some vacation time from work and met the rest of my family for about 5 days of Olympic fun. It was such an amazing experience to stay in the heart of downtown with everything happening around us. Each morning we'd look out to see the slopes of Grouse Mountain and the Olympics rings in the waters of Coal Harbour (where my parents live part time and where I rowed crew over the summer). It's crazy to think that so many huge events were held at the arena just blocks away from our current apartment. We witnessed Apollo Ono win his gold medal in short track speed skating and I even walked to my first ever live hockey game. In hindsight, I wish we would have stayed the whole two weeks. I still can't believe that I missed living in a city where the Olympic were being held by just 3 years! I supposed I will just have to be extra thankful for the time we had. Okay, back to these cupcakes. In honor of the games being held in Sochi, Russia, I wanted to create a recipe revolving around a White Russian. This Kahlua-coffee-vodka drink it pretty sweet, tasty, and perfect for turning into a dessert. 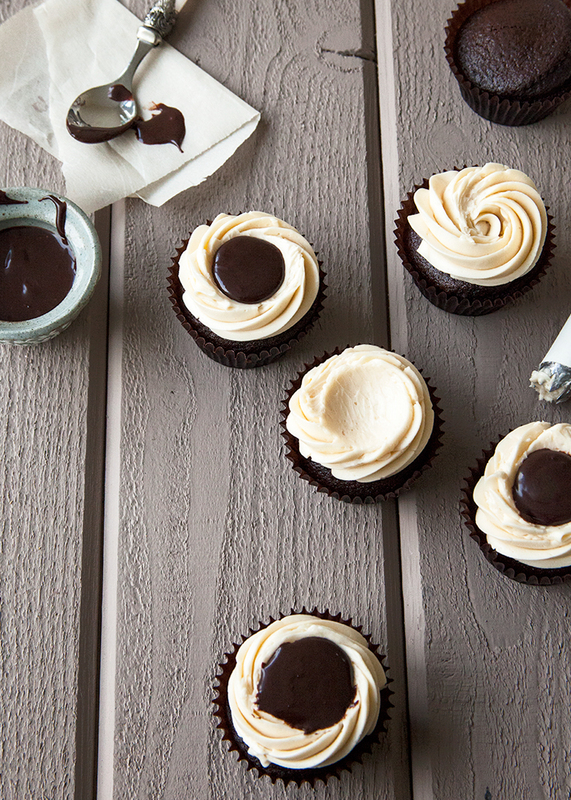 To switch it up, I added chocolate to make these Black and White Russian Cupcakes. 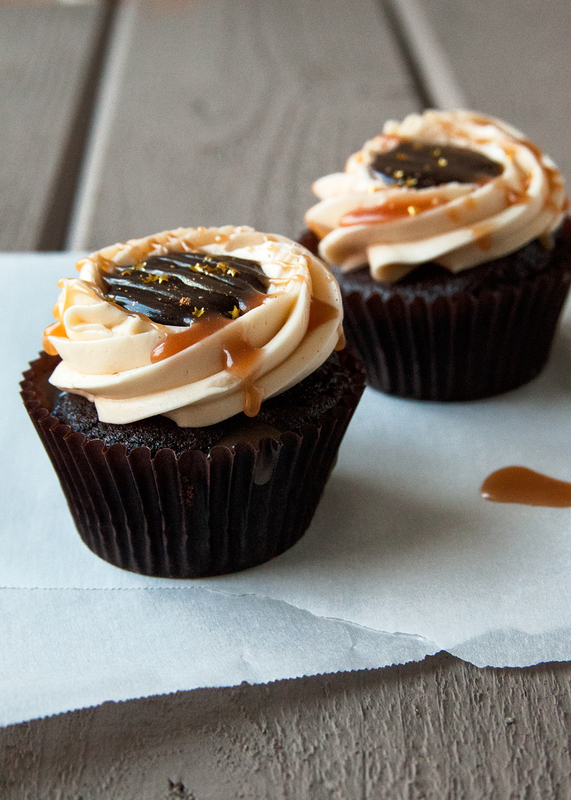 I topped chocolate cupcakes with Kahlua buttercream, espresso chocolate sauce, and salted caramel drizzle. 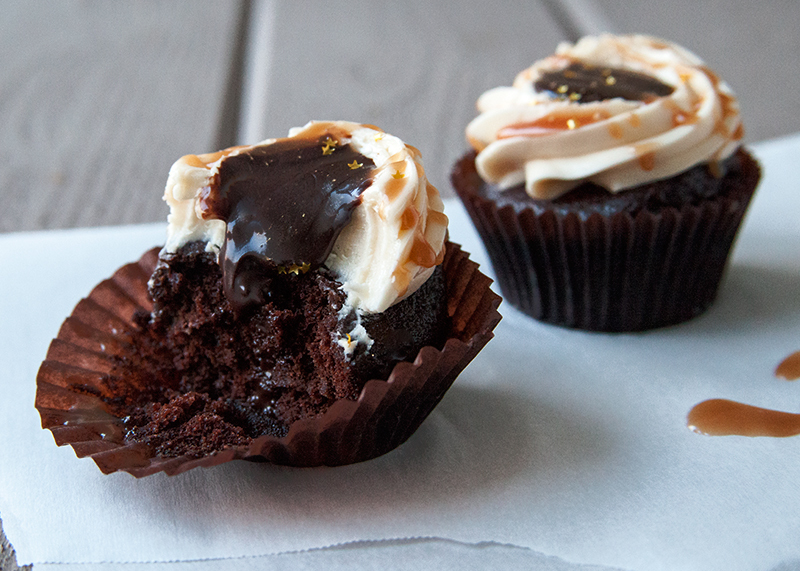 Each cupcake was sprinkled with edible gold stars and gold luster dust. 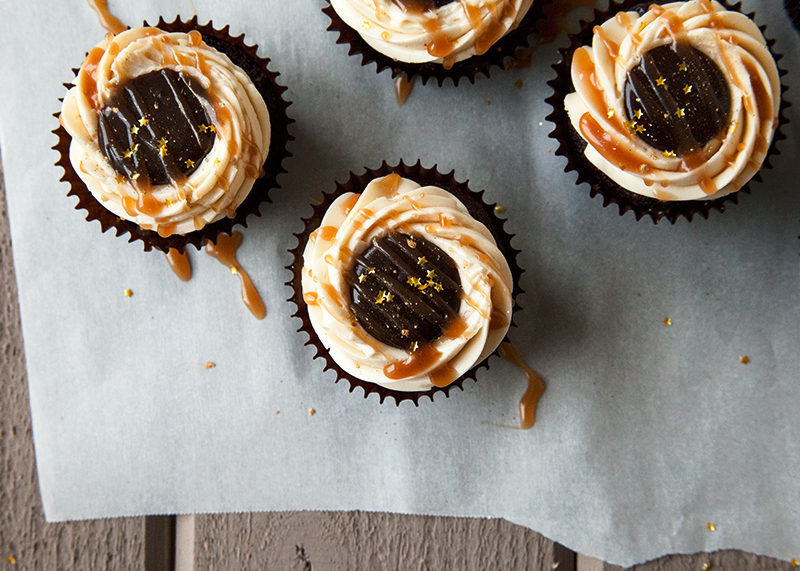 In order to get the chocolate sauce to stay centralized on top of the cupcake, start by piping buttercream in a swirl with a star tip. Using the back of a rounded tablespoon, press down in the center and wiggle it around to create a well for the chocolate sauce to sit in. Spoon in chocolate sauce before drizzling with caramel. Preheat over to 350 degrees. Line cupcakes pan with paper liners. Sift together all of the dry ingredients (not the sugar) and set aside. Place sugar and oils in the bowl of an electric mixer. Mix with a paddle attachment until combined. Add in the eggs and vanilla. Mix until combined. In alternating batched (starting and ending with the dry), add in the dry and wet ingredients in about 3 batches. Using a disher, evenly distribute the batter in the cupcake pan. Fill papers about 2/3 full. Bake about 18-20 minutes, or until done. Place egg whites and sugar in the bowl of an electric mixer. Whisk gently to combine. Put water in the bottom of a medium saucepan over medium heat. Place mixing bowl on top to create a double boiler. Once hot, return mixing bowl back to the mixer. With the whisk attachment, beat on high until the mixing bowl is room temperature. Stop mixer and switch out the paddle attachment for the whisk. With the mixer on medium-low, add in the butter. Add in the vanilla and 1/4 cup of Kahlua. Continue to mix and increase the speed of the mixer. Mix on medium-high until light and fluffy. Add more Kahlua (a tablespoon at a time) if desired. Mix buttercream until incorporated but does not lose its consistency. The Espresso Chocolate Glaze can be found here. Subtract the whiskey and increase the amount of cream by 1 tablespoon, or feel free to keep it as is. White Russians are typically made with vodka, but keeping the whiskey makes 'em boozy-fun! 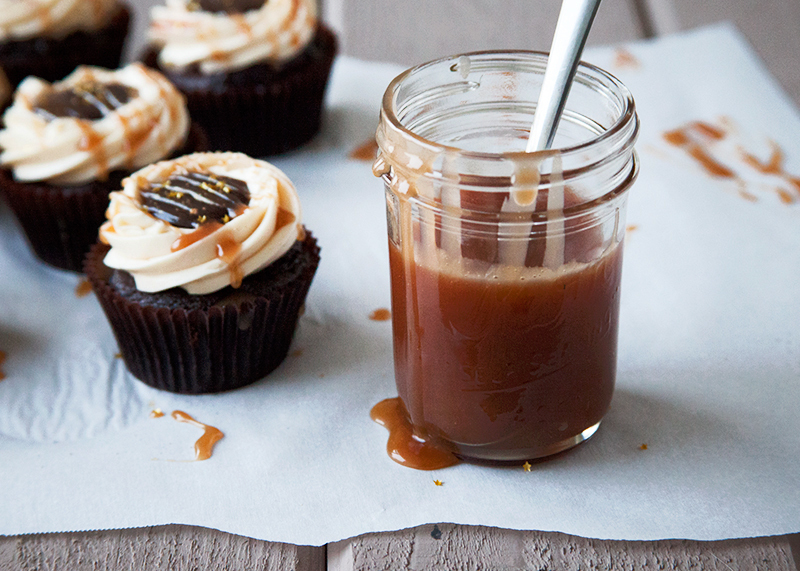 My favorite Salted Caramel Sauce can be found here - adapted from Baking a Moment.